Earlsdon based photographer Rick Medlock beat off international competition last autumn to win a London Photographic Association Gold Award with images of Coventry’s subways. These images were taken from a trilogy of pictorial books about Coventry City Centre under the title ‘Anatomy of an Island’. The first release from this trilogy, Part One, Subways and Bridges, published on the 1st June 08, looks at the pedestrian walkways in and out of the City Centre. Rick said, “This is the first major pictorial documentary on Coventry that has been produced for many years, and with the refurbishment of the City Centre under way, a lot of structures in this documentary will be lost forever or radically changed. 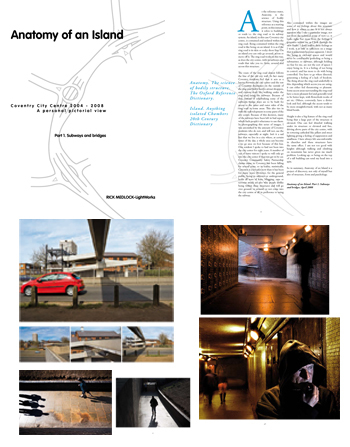 What I was trying to do in this series of images was to look at the structure and form of the area and capture the feel of Coventry as it was from 2004 up until the beginning of 2008 and I feel I have been successful. Coventry has an atmosphere that people can find unpleasant and threatening, but it wasn’t apparent to me until I started to film this project how much that can be the case. That is not to say that Coventry is worse then any other City in the UK, but it is more a sad reflection of what we, as a nation, have become. On a positive note, I have been overwhelmed by the support of local and international business in helping to fund this project”. Part Two - City Centre will be released towards the end of the year and Part Three – Refurbishment at some time in the future.